There’s a couple of new faces and, after Dylan Brown’s back injury, a new leader in our Rookie Rankings for Round 4. Briton Nikora bounced back from a quieter performance against the Cowboys last week with a strong showing in the Sharks’ loss to the Eels in Round 4. In doing so, he takes top spot in the Rankings for the first time. Playing the full 80 once again, Nikora ran for 108 metres from 13 runs, broke three tackles and made 34 with just one miss. Maika Sivo continues his climb up the rankings after another strong performance on the wing for Parramatta. Alongside his wing partner Blake Ferguson, Sivo got the Eels on the front foot all night, with 62 of his 194 metres being post contact. The Fijian now averages 148.5 metres per game. An unreal performance by Jayden Okunbor in Canterbury’s close loss to the Storm has seen the big man jump five spots in the ranking. Okunbor has been a revelation for the Bulldogs and comfortably backed up his stellar debut. 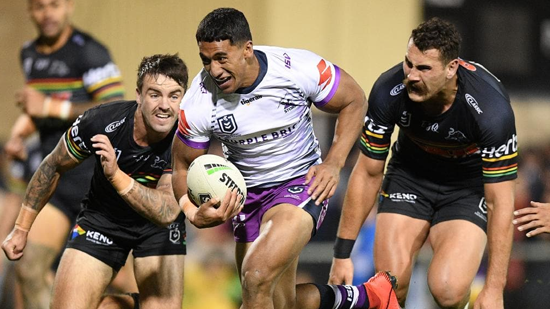 He crossed for his first NRL try and ran for a whopping 290 metres and made three line breaks, twice running over the top of the league’s best player, Cameron Smith. A back injury has sidelined Dylan Brown indefinitely although his good form in the opening three rounds keeps him in the rankings for at least one more week. Brown suffered the injury in a pre-season trial but fought through it to make his debut a few weeks later. Jack Williams played fewer minutes than his last two games but still got through a tonne of work. The Cooma junior made 73 metres from 7 runs and 21 tackles in 31 minutes in his side’s loss to Parramatta. Like Jack Williams, Corey Horsburgh played a shorter stint in Canberra’s big win over his former side. Still in 24 minutes, he ran for 58 metres, 35 of those post contact, and made 17 tackles to stay in 6th spot. Mikaele Ravalawa scored his second NRL try in the Dragons’ golden point victory over Newcastle. The former Raider made 147 metres from 15 runs and broke four tackles to move up our ladder. He’s now averaging 135.8 metres per game for the season. The Broncos were dominated by the Roosters last Thursday and young front rower Thomas Flegler played just 25 minutes, dropping four places in our rankings. Defensively, the Tully junior was strong, making 21 tackles for just one miss. With Josh Addo-Carr unavailable, Craig Bellamy handed Marion Seve his first NRL start in Melbourne’s win over the Bulldogs. Seve repaid his coach with a great performance, running for 158 metres and not missing a tackle. 18-year old Bronson Xerri looked like anything but a rookie in his NRL debut this past weekend. A local Cronulla junior, Xerri ran for 153 metres and didn’t miss a tackle in his side’s loss to the Eels. He also saved a certain try, outpacing Clint Gutherson who put through a kick and looked set to score. Manly’s Reuben Garrick continued his solid rookie form in Round 4, running for 109 metres and breaking 2 tackles in the Sea Eagles’ win over South Sydney. Matt Ikuvalu was a try scorer in the Roosters’ big win over the Broncos and added 228 running metres and nine tackle breaks. Former Junior Kiwi Chanel Harris-Tavita replaced fellow rookie Adam Keighran in the halves for the Warriors in Round 4 and did not look out of place. He kicked five goals, ran for 74 metres and broke five tackles in their win over the Titans. 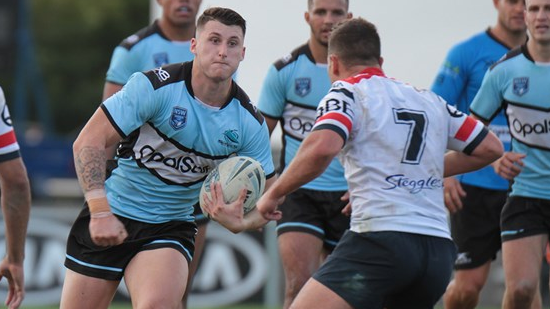 Kyle Flanagan returned to first grade for the Sharks in Round 4, playing his second NRL game. He kicked 2 goals and made 21 tackles without a miss. Our Rookie Rankings, released after each round, take into account a player’s previous round performance and their season as a whole.